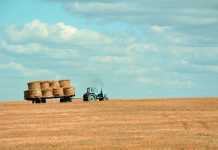 Home Admission Exams Agricultural Bihar Agricultural University Admit Card 2019 – Download Here! Bihar Agricultural University Admit Card 2019 – Download Here! 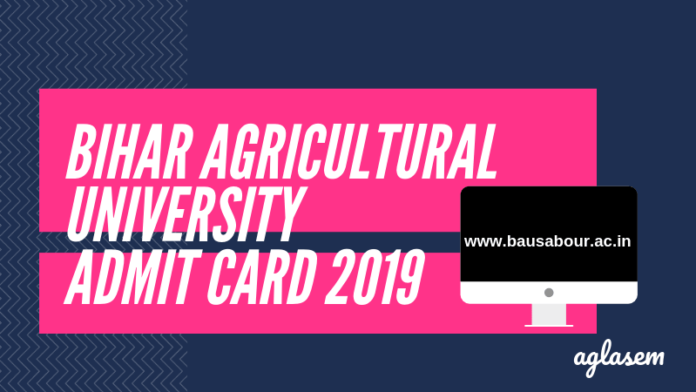 Bihar Agricultural University Admit Card 2019 – Bihar Agricultural University issues all its Master’s and Ph.D. applicants admit card for the entrance exam, on its official website www.bausabour.ac.in. Usually, it is released by the 2nd week of June, every year in online mode. Candidates just need their Registration IDs to retrieve their admit cards for the exam. No candidate is allowed to enter the exam hall without a valid Bihar Agricultural University Admit Card 2019. To get more details on Bihar Agricultural University Admit Card, keep reading! The Bihar Agricultural University Admit Card 2019 contains candidate’s name, exam venue, exam roll number and exam timings. Candidates can check the schedule related to its various events, from below. Download Admit Card Here: Candidates can download their Bihar Agricultural University Admit Card 2019 from here. How To Download Bihar Agricultural University Admit Card 2019? Visit the official website or directly click on the link provided below the table. Click on the link which says “Bihar Agricultural University Admit Card 2019”. Enter the Registration Id or Registered contact number. And then click on submit to proceed. Your Bihar Agricultural University Admit Card 2019 will be displayed on device’s screen. Download it , take two print outs and carry them necessarily on the day at the exam hall. Before downloading a copy of the Bihar Agricultural University Admit Card 2019, candidates must check whether these details are printed correctly. Duplicate Admit card will be issued by the Registrar one day before the date of examination on payment of specified fee for which 2 photographs and proof of application submission have to produce by the candidate himself/herself. The candidate shall be present at the centre half an hour before the commencement of the Examination. Candidate will not be admitted to the Examination Hall after the commencement of the Examination. Candidate who does not produce the Admit Card shall not be allowed to sit in the examination hall by the Centre Superintendent/Invigilator. Candidate must preserve the Admit Card till his/her admission in the institution/Department. Candidates are not allowed to leave the Examination Hall before expiry of the time and handing over the OMR sheet and Question paper (Test Booklet) to the concerned Invigilator. The candidate shall not remove any page(s) from the Test Booklet and if any page(s) is/are found missing from his/her booklet, he/she will be prosecuted against and shall be liable for cancellation of his/her candidature and legal action. The candidate must fill in the Box with black ballpoint pen of good quality. Candidates are not allowed to bring any books, notes or calculator, cell phone etc. in the Examination Hall. Candidate must follow the instructions strictly as given by the invigilators in the examination hall. No cutting or overwriting is allowed. Impersonation in any form will lead to cancellation of candidature and legal action. 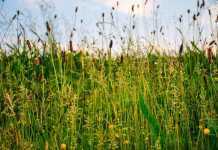 Bihar Agricultural University announces the result of Master’s and Ph.D. entrance over its official website, www.bausabour.ac.in. Usually, the result is declared in the form of merit list by the first week of July, every year. On the basis of the name appearing of the selected candidates, the University invites to appear for counseling round. Last year, the cut off marks for Ph.D and Master’s was 40% for SC/ST candidate and 45% for other categories. Further, candidates will be allotted seats,a s per the reservation policy of Bihar Government. 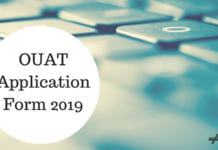 OUAT Application Form 2019 (Released) – Apply Online From Here!